Keep track of your remote meetings in SuiteCRM? See your meetings and plan routes visually by using this map add-on. Display all of your meetings on a map right from your Calendar. 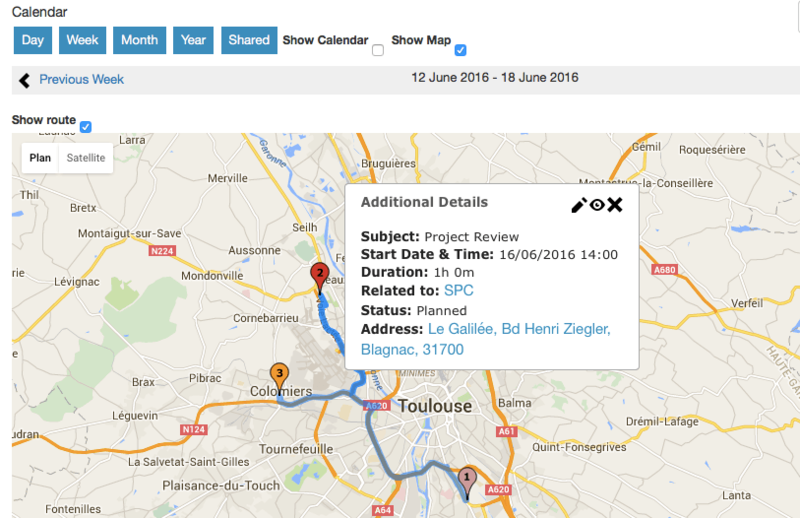 Meetings can be displayed on a map in Day / Week / Month / Shared views. In Shared Calendar, you can select which users' meetings are displayed. With the Show Routes option checked you can plan ahead and find how to get to all of your meetings. Visualizing your SuiteCRM geocoded data is now easy! With this Heatmap dashlet you will be able to easily identify clusters of data on a map based on the density of the data points and optional data points weight.